Here's a quick overview of some of the smaller projects I've been working on. A simple and easy to use harddisk recording tool with some extra features. The fast, precise level meter is active before and during record. You can change input, gain and monitor-level at any time. 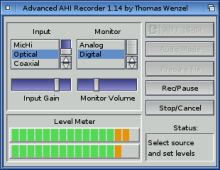 AHIRecord works with any AHI compatible recording device. All in one compact 27KB Executable. Amiga makes it possible! A versatile soundplayer that supports several filetypes and output devices. Amongst others it can play RIFF-Wave, AIFF, IFF-8SVX, SUN-Audio and decodes different compressions like µ-Law, A-Law and ADPCM. It can be used from Shell or from Workbench and can play directly through Amiga's soundchip, the MPro digital audio interface or the AHI audio system.